Don't feed the fish! - Have you heard the Sirens Call? Once of the best parts about island life is being surrounded by an abundance of wildlife in the Ocean. As we’ve said before, Indonesia is extra special because of the seemingly infinite diversity around the islands of Lembongan. Nusa Ceningan and Penida too. 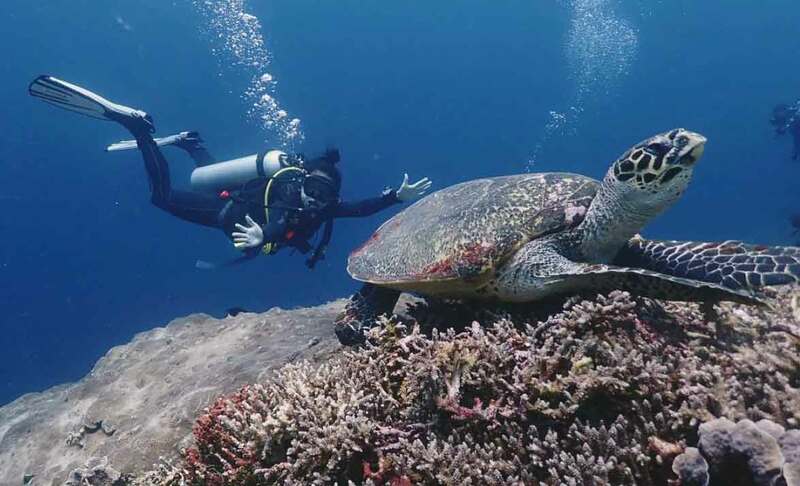 We love to take our guests diving and show them the aquatic life and underwater buddies we meet every day. Unfortunately, as the island becomes more popular, the number of people visiting increases. While this is good for tourism, it can have a down side for the local ecosystem. What is this down side I hear you ask? Not this time, though that is a problem too. I am, in this case, talking about the seemingly much more innocent practice of fish feeding. This blog actually came about because I was sitting at a local coffee shop and overheard a couple of new divers. They were talking about how they had just been diving and the dive operator was throwing food in the water to attract the fish. They thought it was amazing because they were surrounded by a feeding frenzy. It seems so harmless so what’s the problem? A school of Scissortail Sergeant being fed. Whether it’s a local captain throwing a few biscuits in the water. Or maybe a large scale operator with divers feeding fish in front of windows of glass bottom boats. It is done to attract fish to the boat and entertain the tourists. Odd then, that a lot of people seem unaware that this is not only bad for the fish, but also the coral reefs as well. Now before I go on, I’m not being a killjoy. When visitors to the islands were few it made little difference. With so many daily, if not hourly, visitors you can see the change happening before your eyes. This is an actual promo shot from a company advertising fish feeding. The fish don’t seem to mind so what’s the problem? Sounds obvious I know, but just like humans, fish need the right type of food in their diet. Croissants, chocolate biscuits or even slices of fresh fruit. while delicious to us, are not part of a fishes natural diet. Bread in particular is bad, as it will swell in the fish stomach causing them to expand and suffer serious health issues. At best, they may get temporarily sick. At worst, they will die or be taken by predators as they unable to act in a natural manner. As this unnatural food source becomes more common it can cause a decline in some species and overpopulation in others. 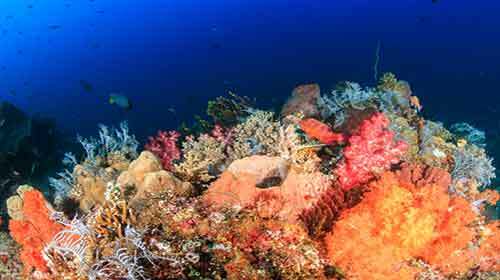 Further, foods that don’t get eaten by the fish, fall to the ocean floor and pollute the reefs directly. Adding food to the water around reefs increases nutrient levels which then increases the growth of harmful algae that damage corals. Algae can and should be a natural food source and needs to be eaten and removed from the reef. In fact, the majority of reef fish are grazers, meaning they only eat algae. 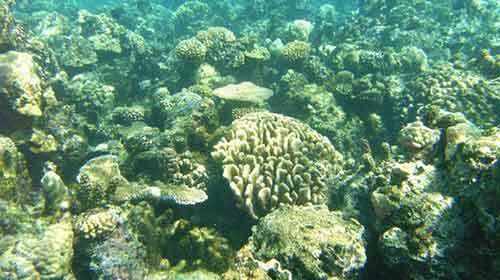 They keep the growth of the algae on coral reefs under control so that the reefs aren’t smothered. If we fish feed, their behaviour is modified so that they no longer graze on the harmful algae that need to be removed from the reef. This results in the algae becoming overgrown. Eventually the reef is destroyed and the habitat of many species is lost as the reef is literally choked. A reef with excess algae buildup, (from excess nutrients and warming), compared with how it should look… You decide. Ocean fish (and all wild animals) should be wary of interactions with humans. Though not always, our interactions with them tend to be detrimental to the animal involved. 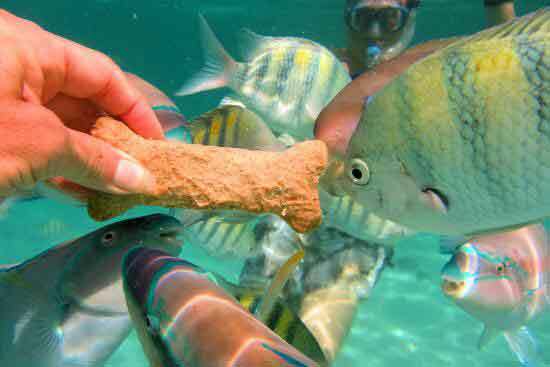 There’s an argument that any snorkeling or diving is affecting the animals behaviour. While this may but true in some cases, we should do everything we can do minimise our impact when interacting with these animals. The kind of interaction we like. Let nature do it’s stuff. Feeding fish is conditioning the animals to associate humans with food and so reduce the natural instincts. This affects natural feeding cycles of famine and fast and can give predators a further advantage when lots of ‘tamed’ fish await human interaction in one area. A healthy reef relies on competition for food and space. Old or sick fish will die while the strongest survive. While it may sound overly dramatic, in some cases, feeding the fish may allow weaker specimens to live longer and have a negative effect on the health of the overall environment. 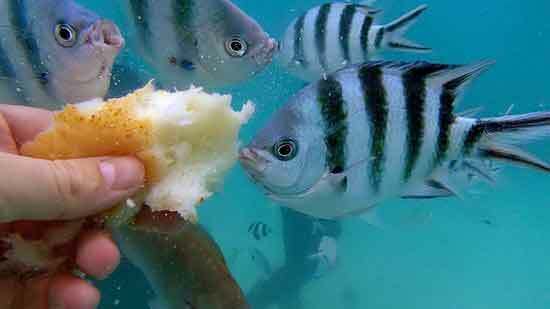 So next time you are on a dive or snorkel trip, remember not to throw that banana skin or handful of biscuits over the side. The marine life really doesn’t need it.